That's the thing about benches. They demand to be sat on. As anyone who's seen or read The Fault in Our Stars knows, the bench is probably the third most important character after Hazel Grace and Augustus Waters. Perhaps this explains why Shailene Woodley and Ansel Elgort were in Los Angeles to commemorate their movie with a permanent bench monument symbolizing Hazel and Augustus's eternal love. "I just started tearing up," Shailene reportedly said. "This is the perfect tribute. It seems it's the exact same bench from the film." Well, it isn't, because that one got stolen. But close enough. 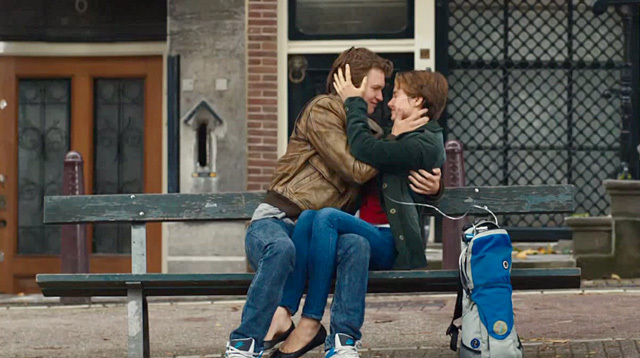 The bench will reside on the private 20th Century Fox lot, which means that TFIOS fans will still need to go all the way to Amsterdam for their own romantic photo op. "I guess they are going to have to sneak onto the Fox lot," author John Green told USA Today. "Am I going to get in trouble for saying that?" Eh, probably not. Encouraging tweens to do illegal stuff isn't as frowned upon when you can basically print money with your books.